Price of Philips Xenium X806 Classic Mobile Phone. This model of Philips Classic Mobile Phone is with 3" Screen, Dual SIM, Upto 1 month standby, Bluetooth Stereo Music, Micro SD Card slot for extra memory storage, Upto 8 Hours of talk time, 5 Mega Pixel Auto focus camera with flash, On screen display on RDS FM Radio stations, Fat intuitive touch screen for swift navigation, Touch sensitive dashboard for smart access to applications, 262K Color TFT display for vivid colorful graphics. Price list 2018 of Philips Xenium X806 Mobile Phone is listed here. 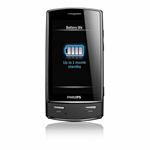 Philips Mobile Phones Prices includes latest price of this model of Philips Classic Phone with latest features. Prices are listed here for you to buy online latest Philips Mobile Phone at cheap rate.